They are two separate mothers, with two different and unconnected experiences with cyber-bullying. For one - Mandy Trowbridge - the painful loss of a child who was a victim. For the other, who spoke anonymously, the shock of being told by police that her child was a cyber-bully. But from both, the same message: Cyber-bullying is a real threat that parents and children must tackle to avoid similar heartache in their own homes. Both mothers shared this message and their separate cyber-bullying experience with BBC Newsline ahead of the launch of a new awareness programme designed to promote online safety to children and parents alike. The programme, developed by the Safeguarding Board of Northern Ireland, will be shared in schools, church groups and community groups. Its aim is to make parents and children aware of safety when using social media sites, chat room and internet forums and also to be mindful of the damage that can be done by sending threatening messages online or on mobile phones. The awareness strategy comes at a time when the NSPCC has said that children as young as five are on social media and one in three has been the victim of cyber-bullying. 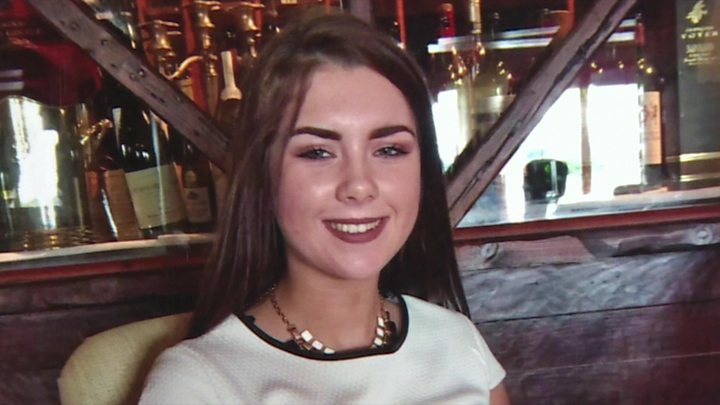 One of those victims was Elle Trowbridge, a 16-year-old from County Tyrone, who took her own life in April after being targeted by cyber-bullies since she was 11. Her mother Mandy told BBC Newsline's Donna Traynor that she did not want anyone else experiencing what her and her family have gone through. "Awful messages were sent to her phone one day," she said. "Elle came and told me about it straight away. "So the following day I reported that to the police but Elle really believed if that's what people wanted, that's what she should do - so, unfortunately, she did start self-harming at just the young age of 11. "And Elle never really recovered from that. "We had her at the doctors, we had help from social services, therapists but unfortunately about five or six weeks before she passed away another message came through, again anonymously. "Elle just couldn't understand why somebody could be so cruel and this just sent her spiralling." Mrs Trowbridge said she believed children had sent the messages but that she "did not want the same thing to happen to them, for them to fall into a deep, dark place". "Possibly they need help and intervention. Children act on impulse and emotion. They don't think of the consequences months down the line." The other side of cyber-bullying was experienced by a mother who told BBC Newsline that her 14-year-old daughter had sent a threatening message to another child asking her to self-harm and consider taking her own life. 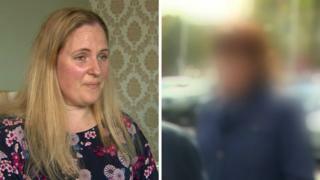 The mother, who spoke anonymously, said police arrived at her door and told her that her daughter "had sent a very terrible message to someone who was a friend". "I couldn't believe that my daughter would do that. "When she was sending that text message she was 14, and whenever the police came along to my house and I saw her sat there at the table she looked like a four-year-old girl. "I realised she is a child but she committed something very, very bad. "She was shocked and I think she was more horrified that she actually got caught. "I think she assumed she would get away with it and I don't believe she gave any thought to the possibility of that girl taking her life because of that message." The mother said she believed her daughter was encouraged to send the message because of peer pressure. "I know my daughter is not innocent because she pushed the button and sent the message. "But I do believe that because her friends were there she had power - I do believe she had support do this terrible thing she might not have done on her own. "But she pressed the button and sent the message. "I hope they (children) realise they cannot blatantly harass anybody and not get caught." The important message, she said, is that children and parents become aware of the threat cyber-bullying poses. "You don't know what they're looking at on the phone," she said. "You have no idea. "You try to give them an element of trust but that can only go so far and they are not fully developed human beings. "This cyber stuff is encouraging them to be negative, to show blatant and absolute harassment to other weak individuals. This is not the way to go. Where will it end?"